The price of field pea grain may limit its use. However, excellent palatability, nutrient density and digestibility are positive factors. Gestating beef cows grazing pea regrowth in the late fall. Field pea (Pisum sativum) is a cool-season grain legume that is palatable and nutritious as grain and forage. The grain is an excellent source of crude protein (24.3 percent, Lardy and Anderson, 2009), energy (0.70 megacalorie of net energy gain [Mcal NEg] per pound; National Research Council [NRC], 1996) and other nutrients for beef cattle (Table 1). This nutrient-dense grain works well in formulations for creep feed, backgrounding and finishing rations, and for beef cows that need supplemental protein and energy. The energy level of field pea is similar to corn. Multiple feed products with varying nutrient content are available from field pea production (Table 2). We recommend processing (rolling or cracking) field pea grain. Inclusion of field pea grain at a minimum of 10 percent of the finishing diet may improve the tenderness, juiciness and flavor of beef without affecting other carcass traits. Field pea grain is an excellent pellet binder and contributes to the nutrient density in formula feeds. Residue from pea grain is useful as forage for beef cows. Field pea grown for forage is nutritious and palatable and can be harvested as hay or haylage. Forage pea often is grown in mixed stands with oats or barley and may have potential for double cropping. Cattle producers who feed field pea grain or forage comment positively on the palatability and have been very satisfied with animal performance. Table 1. Nutrients in field peas and other common feeds. Table 2. Field pea grain, pea coproducts and pea forage nutrient analysis. Adapted from Lardy and Anderson, 2009, “Alternative feeds for Ruminants,” AS1182, p. 21. Northern states in the U.S. and the Canadian Prairie Provinces are the primary growing areas for field pea. North Dakota and Montana are the leading states for pea production in the U.S. Field pea is cold-tolerant (down to 26 F) and water sparing, with yields typically equal to or greater than spring wheat. Specific varieties of field pea have been developed for forage. Forage pea often is grown with a cereal grain, forage-type oats, triticale or barley, and harvested as dry hay or haylage. Pea forage often is grown to replace winter-killed alfalfa, and has potential for double cropping if moisture is available. Light tillage of pea fields immediately after the grain has been harvested can result in volunteer growth when moisture is available. This growth can be used for late-fall grazing or a possible haylage harvest. Palatability is critical when starting calves on feed. In creep feed, receiving or growing diets, inclusion of field pea results in greater feed intake. During finishing, intake of rations with field pea was equal or less than diets without field pea, but gains were not affected, resulting in equal or improved feed efficiency. Field pea grain contains 0.70 Mcal/pound NEg (equal to corn) and enough protein (24.3 percent crude protein) (NDSU Extension publication AS1182, “Alternative Feeds for Ruminants,” ) to be considered a protein supplement in many rations. Field pea protein is highly rumen-degradable, providing an excellent source of protein for rumen microbes. Starch in field pea grain degrades more slowly in the rumen than wheat or barley and at about the same rate as corn. Field pea grain is an excellent binding agent for pelleting feeds. Pea screenings are more economical than pea grain and often are used in formula feeds as a binder. Pea starch may be used to improve pellet quality as well. The optimum percentage of pea grain or coproduct to add is based on multiple factors, including the pelleting properties and nutrient content of the manufactured feed. The potential range for pea inclusion in pelleted commercial feeds is 5 to 50 percent. Generally, field pea is fed in relation to nutrient content irrespective of color (green or yellow). Protein content can vary due to variety, yield, soil type, fertility, temperature, rainfall, planting date and year. An NDSU study that compared ground, rolled or whole-pea grain in creep feed formulated with 40 percent field pea found no effect on feed intake and gain due to processing treatment. Daily gains were numerically greater, however, at 3.31 pounds per head for rolled pea, compared with gains of 3.12 pounds with ground pea and 3.13 pounds with whole-pea grain. The same three processing treatments (ground, rolled or whole) were used in finishing diets for feedlot heifers with field pea included at 28 percent of the diet. Dry-matter (DM) intake was similar for the three treatments. Average daily gain was greatest at 3.40 pounds for rolled peas, compared with 2.95 for whole peas and 3.11 pounds for ground peas. Gain efficiency was similar for all treatments. The particle size of the ground peas averaged 0.03 inch, rolled peas averaged 0.12 inch and whole peas averaged 0.30 inch. However, in a Nebraska finishing study, no differences were observed between dry-rolled or whole peas fed at 15 percent or 30 percent of the diet DM to replace corn. In an NDSU feeding study, steers fed growing diets gained faster with whole pea, compared with rolled or ground. Field pea does not need to be processed when fed to cows, according to comparative research. However, processing field pea by dry rolling may allow more even mixing and consistent digestion in high-forage diets. Field pea nutrient density and palatability make this grain an ideal ingredient in creep feeds. In replicated research studies, creep feed containing field pea was consumed more readily and resulted in increased calf gains. The recommended inclusion rate is 20 to 40 percent of the formulation, with a target protein content of 16 percent for the creep feed. Commercial feed manufacturers use field pea in creep feed as a binder as well as to enhance palatability and nutrient content. Rolled pea grain or pea splits may be included in home-mixed creep feeds. Multiple studies with field pea included at various levels in postweaning receiving diets indicate equal or improved feed intake and gain with field pea in the diet. Field pea provides protein and energy to calves in a highly palatable grain. Research suggests including 10 to 30 percent of dry rolled pea grain, based on protein needs for newly weaned calves. Palatable, nutrient-dense diets support improved immune systems. Beef cattle producers use field pea grain as a protein supplement in backgrounding or growing rations. The nutrient density of field pea allows modest levels of inclusion in high-forage wintering diets. Pea also is useful in more energy-dense diets fed for higher gain goals. Depending on the basal ration, we suggest 2 to 4 pounds per head daily to meet protein needs and provide supplemental energy. Several research trials in multiple states have proven the value of field pea as feed versus other feeds with equal or better performance for growing calves. Field pea can be fed in dry-hay diets or diets with silage. Several research studies have proven the nutritional value of field pea in high-energy finishing diets. Most often fed with corn grain, field pea can be fed at any level up to the entire grain portion, according to an NDSU study. However, a more common level is field pea fed at 15 to 20 percent of the diet, which generally will satisfy supplemental protein needs for finishing steers and support equal or improved gains. Some data indicates steers eat less with field pea in the diet but gain the same, resulting in improved efficiency. Sensory panel analysis indicates an increase in tenderness, juiciness and taste when field pea grain is included in steer diets at a minimum of 10 percent for 76 days or more prior to harvesting the animals. “Pea-fed beef” improves consumer enjoyment of beef and may warrant further investigation or specialty market development. No data is available on the effect of field pea forage on carcass traits or sensory panel response. Multiple research trials support the use of field pea grain as a protein and energy source in properly balanced diets for beef cows during mid and late gestation. Seedstock producers have reported excellent growth and muscle development in growing bulls fed field pea as part of the ration, but no comparative research has been conducted. Pea forage is an easily grown annual forage with double-cropping potential when moisture is adequate. 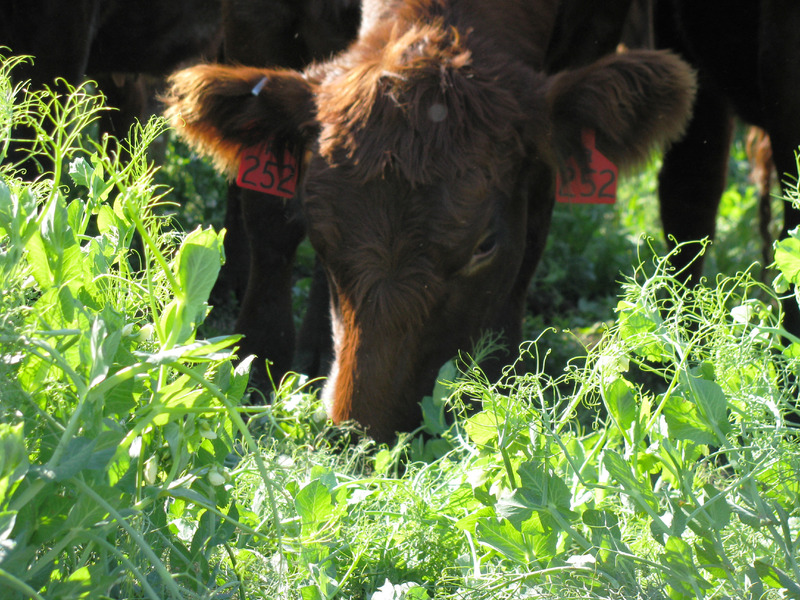 Pea forage can be substituted for alfalfa and supports excellent animal performance in balanced feedlot, beef cow and lactating dairy cow diets. Pea grown for forage often is planted in mixed stands with forage barley, forage oat (Table 3) or triticale. Adding field pea to the cereal grain forage increases protein content. Pea forage crops can be grazed fresh or swath-grazed in the late fall for winter consumption. Pea grain fields lightly tilled after grain harvest may produce a volunteer crop if adequate moisture is available. An even better approach is to no-till seed a cover crop into the pea residue. This will diversify the mixture with the growth of volunteer peas. An extended frost-free period in the fall allows this cool-season crop to develop with blossoms in some years and set pods. This “cover crop” forage may be grazed or chopped and ensiled, depending on the time of year and other factors. It also can be left in the field for soil organisms that can enhance next year’s crops. More information on the proper harvesting and storage of haylage is available in an NDSU Extension publication, “Quality Forage: Haylage and Other Fermented Forages” (AS1252) available from your county agent. Some studies suggest minimal differences in grain and forage-type pea harvested for hay or silage, but new varieties of forage pea hold promise for improved feeding potential. In one recent NDSU study with forage at 30 percent of the diet, field pea harvested as hay was fed to growing steers as the sole forage or mixed with barley hay at equal amounts. Feed intake and gains were greater for diets containing field pea forage than the control diet, which was based on grass hay. Pea forage is highly palatable and is becoming more common in cover-crop mixtures. More research is needed on growing and feeding the variations available for pea forage production. Table 3. Forage production and nutritional value of field pea and cereal grain forages. *S. Zwinger, Carrington Research Extension Center Annual Report, 2011. Some livestock producers grow their own pea grain to assure a supply and use the crop residue for cow rations. Screenings and off-quality pulse grains (pea, lentil and chickpea) procured at competitive prices may be useful, but these coproducts can contain substantial amounts of foreign matter. Pea forage harvested in midsummer may offer the opportunity for double cropping or volunteer regrowth, or cover crops with field pea sown after grain harvest that can provide grazing opportunities for beef cattle in late fall. Field pea is an excellent rotation crop for small grains and can provide protein and energy for livestock that ultimately may enhance the biological and economic sustainability of farms and ranches. Field pea is an excellent rotation crop for small grains and can provide protein and energy for livestock that ultimately may enhance the biological and economic sustainability of farms and ranches. Published with support from Northern Pulse Growers Association.